That was too loaded a remark. If I had let it bog me down then, I would have been ashamed of myself. Nor would I have had the courage to write this today. After almost 4 years with the awesome organisation, where I discovered several hidden traits in me, I can say with conviction that listening to your own inner voice is the only way to understand your real self. As to why journalists need to speak…it needs a separate space. Now, suffice to say – a good speaker is different from an efficient reporter or fantastic conversationalist or rutheless debater, panelist, critic… et al. And Toastmastering is not only about communicating. It’s leadership, too. Again for the ignorant, a good leader is not only who takes pride in teams’ achievements or specializes in ordering about and delegating or keeping the pack in line… et al. There’s none to inspire and encourage you all your life! We adults are ridiculously hopeless kids at times. When we feel a lack in executing our duties in all its efficiency or living life to its fullest, we decide that we need help in sprucing ourselves up. We approach life coaches, join self-development programmes or simply seek advice and pour out our hearts to anyone willing to lend their ears. But when we are offered help or shown the path, we hesitate, procrastinate, alter, amend or become too busy at once. The contest season in Toastmaster’s has begun. It’s amazing an opportunity for anyone wanting to face an audience, receive feedback and more importantly test your own self. And yet, the enthusiasm with which people join the programme vanishes as the contest date nears. They need to be prodded, pushed, cajoled, consoled, assured… as if only their action would save planet earth, so please stand up and save mankind from doom!! If you believe you need to develop yourself and you have taken that first step, you might as well go the whole yard. There’s none to inspire you all your life. There’s none to encourage you at all times. Even kids are spoon-fed only for the first few years. So stop expecting seniors and mentors to hold you by your pinkie and lead you every time you pull up a puppy face. Isn’t that why you paid the fee and vouched your time? Or if you thought only paying the fee will get you the desired result, then you should be in primary school sucking lollipops. Oh, yes. There will be emergencies and personal reasons. The former I totally understand. But when an emergency plays out at regular intervals, don’t complain if it’s alleged to be orchestrated. I've heard that the Toastmasters do a fantastic job of motivating and encouraging. My nephew joined them and came out feeling wonderful. Yes, in fact, all of us need to learn to speak! 🙂 Loved your post, Nisha! I love these activities, we used to have similar concept in my previous company too. It's later on did I realise how important they have been in shaping my personality. I had the opportunity to join Toastmasters at my previous company. Now I regret not joining it. Such an important lesson for all of us Nisha. I loved how you wrote the post. I little authority and lot of inspiring words. I loved it when you said – If you believe you need to develop yourself and you have taken that first step, you might as well go the whole yard. I related to my driving lessons and how I need to fight my fear to go the whole yard. Well said!You can fool the whole world but not your conscience,the sooner you realize the earliest you reach your self discovery…..journey of excellence…even journalists needs to speak their mind???? Ability to express, write, speak is a wonderful tool given to mankind by nature. You are making effective use of this tool. Yes. we can not expect perpetual spoon-feeding. If we are regularly hiding behind the excuses called emergencies, we are fooling ourselves. Yes. One will chnage… I did! Thanks Mohan.. glad you agree! Toastmasters sound like an awesome concept to help and motivate others. Stage fear is quite a thing, but after a few sessions you get over it. But I still feel a tingling session in my stomach whenever I get on stage. But I love your post so much. We adults need to stop fooling ourselves and buck up and build ourselves. Self development is the most important thing for a person. No excuses should come in between that. I do agree with you on the fact that some people do orchestrate emergencies just to get out of a few things. Shame on them. Good piece Nisha. I'm a distinguished Toastmaster having been in the organisation for 14 years total. I joined because a manager suggested I spoke too quickly (200-300 wpm), and that Toastmasters could guide me in slowing down. Well, I did slow down, and learned many techniques through regular attendance and practice. I now speak at around 100-150 wpm, enter contests, serve as a club officer, and have served as Area and Division Governor. I'm a REP Ambassador, and enjoy all that Toastmasters has to offer. I get what I give, and what I think about I bring about. Toastmasters changed my life and I kept the change. Thank you for your article. Soumya!Good morning ???? 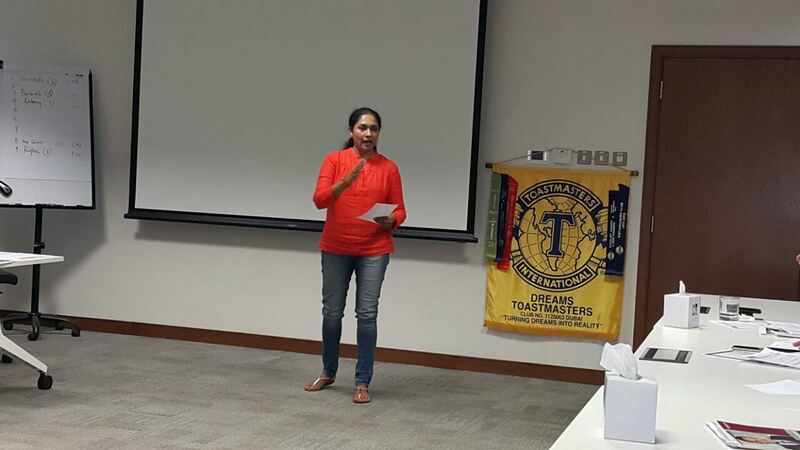 Y don't you walk in as a guest to Dreams toastmasters..we have a women empowerment policy in place ???? It's nice to see that you followed your heart and mastered the art of public speaking. Whatever anyone says, communicating well verbally and in written are the most powerful skills someone can possess, regardless of the profession. Thank you. Glad a DTM agrees with me. I loved the idea of the Toastmaster's public-speaking. I guess anyone interested in getting their voice/viewpoints heard should go for this! Indeed grown-ups need to grow-up someday and learn to fight their own battles and challenges. And if you have the confidence, the gift of the gab and eloquent articulation on your side, all the better!